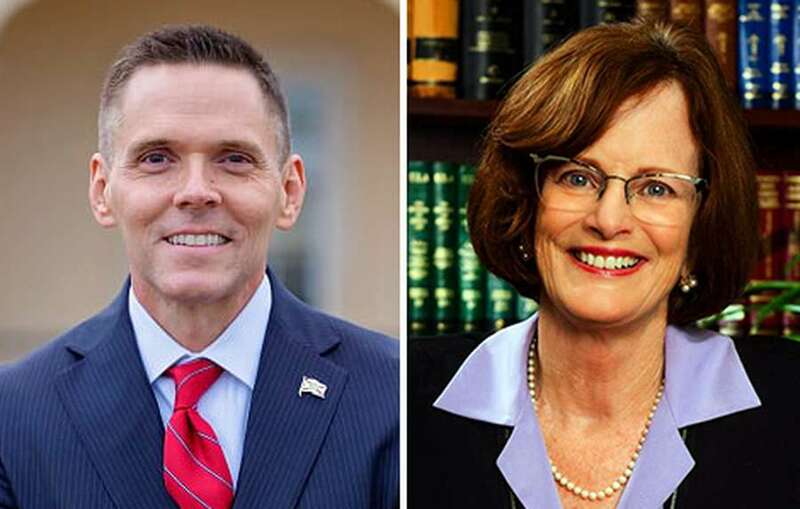 Republican Ross Spano and Democrat Kristen Carlson are competing for Florida's 15th Congressional District. After a neck-and-neck race for the District 15 seat, former state Representative Ross Spano beat out Democrat Kristen Carlson by about 17,700 votes. Carlson held on to a narrow lead in Hillsborough County until a few late precinct results pushed Spano ahead by less than 1 percentage point. TAMPA — After a close race to the finish line, Republican Ross Spano managed to gain a sizable lead late Tuesday night over Democrat Kristen Carlson in the fight for Florida's Congressional District 15 seat. Hours before the final vote was tallied, putting Spano over Carlson by nearly 18,000 votes, early election results were enough for Spano, a former state representative, to make a victory speech to supporters at a Brandon Beef 'O' Brady's. "Here's what I promise you tonight," the 52-year-old Dover attorney said. "I will do everything in my power, 24-7 for the next two years, to represent you well, to be honest with you, to tell you like it is, not to pull any punches, not to lie to you but to tell you straight what I believe, what I'm going to do and why I'm going to do it." "And I tell you something else. You will have access to me," Spano promised. "I will make myself available to you no matter what it takes. I am your servant." The conservative Republican was the early favorite to win the district, which went to President Donald Trump by a margin of 10 points during the 2016 election. GOP candidates have maintained a stronghold on the district since Republican Dave Weldon's 1995 election, but pollsters expected a tough fight between Spano and Carlson, 64, a Lakeland attorney. The respected Cook Political Report shifted the district's rating from "Leans Republican" to "Toss Up" just days before the election. Despite the district's Republican tilt, conditions seemed primed for Carlson to help the Democrats regain control of the U.S. House of Representatives for the first time since 2010 by appealing to voters anxious to keep the seat in Polk County. Redistricting in 2016 shifted more than half of District 15's voters to northeastern Hillsborough County, leaving 35 percent in Polk, including Lakeland, and 15 percent in Lake County, including Clermont. "I'm of the opinion that when people vote it's kind of like a jury verdict," Carlson told the Tampa Bay Times on Tuesday. "Even if you think you're on the right side, you have to accept the verdict and I accept the vote of the electorate." Lakeland Republican Dennis Ross sparked a political frenzy in April when he announced his retirement after 8 years in Florida's Congressional District 15 seat. Twelve candidates made for a contentious and costly primary race that set the tone for the dead heat battle royale between its victors. Carlson, a former prosecutor, entered the race with a rich background in government, business and agriculture – a key industry in District 15. The self-professed "business-oriented moderate" is executive director of the Citrus Processors Association and sat as legal counsel for both the Florida Department of Citrus and the Florida Department of Transportation in Bartow. Yet the victory went to the experienced politician. Spano was elected to the District 59 state House seat in 2012, where he earned praise for his efforts to strengthen 2nd Amendment rights in Florida throughout his three terms. Still, Carlson said she was heartened by voter turnout on Tuesday, and excited to see who shows up to the polls in 2020. "I think district 15 we are on the cusp of changing," she said. For national and statewide election results check out The Buzz. For local election results check out the Bay Buzz. For school board election results check out The Gradebook.